The TomoTherapy system is a pioneering radiation therapy platform that enables precise cancer treatment by tightly conforming the radiation dose delivered to the shape of the tumor. Combined with the option of innovative, TomoHelical TM and TomoDirect TM radiation delivery, the all-in- one system results in more control and greater accuracy in treating a wide variety of cancers. 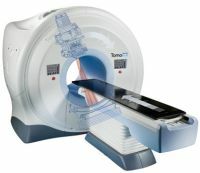 TomoTherapy is a form of computed tomography (CT) guided intensity modulated radiation therapy (IMRT). Daily low-dose CT imaging helps physicians know that radiation will reach the tumor as planned, and that exposure to healthy tissue will be minimized along the way. And, these daily images can be used to monitor and maintain the prescribed treatment during each and every treatment session. TomoTherapy enables for fine adjustments to be made prior to radiation delivery due to its efficient, daily CT scans powered by Image-guided radiation therapy (IGRT). Wide variety of cancers can be treated with greater accuracy and precision, while minimizing radiation exposure to surrounding tissues because the more beam angles provide a highly conformal dose distribution. System facilitates creation of aggressive, higher-dose treatment regimens which can deliver the prescribed dose in a shorter, more convenient treatment cycle for patients. Multiple areas of tumor involvement can be done in one go. Primary and multiple metastatic can be treated with ease. Large fields Radiation is of a great advanced with TOMOTHERAPY. Eg. Whole body Radiotherapy for BMT. The unique design of TomoTherapy helps in treating a wide range of cancers, including recurrent disease in patients who’ve already received maximum radiation doses to critical organs. Treatment plans can be customized according to the patient’s needs, monitored and modified over the course of the treatment. Minimal dose to the surrounding healthy tissues will help in reduced treatment related side effects and improves patient’s quality of life. It allows for simultaneous treatment of multiple tumors, which results in greater comfort for patients and reduced treatment time.